Crosstown bus trips in South Brooklyn are slow and long. Providing faster, more reliable bus service with better connections to existing subway lines is an important step to improve travel for transit riders. Select Bus Service (SBS) improvements in South Brooklyn will help to reduce time spent waiting for the bus, boarding the bus, and traveling crosstown, while providing a more comfortable bus ride and addressing pedestrian and traffic safety issues. Together, these improvements have made for faster, more reliable, and more comfortable transit service throughout the city. 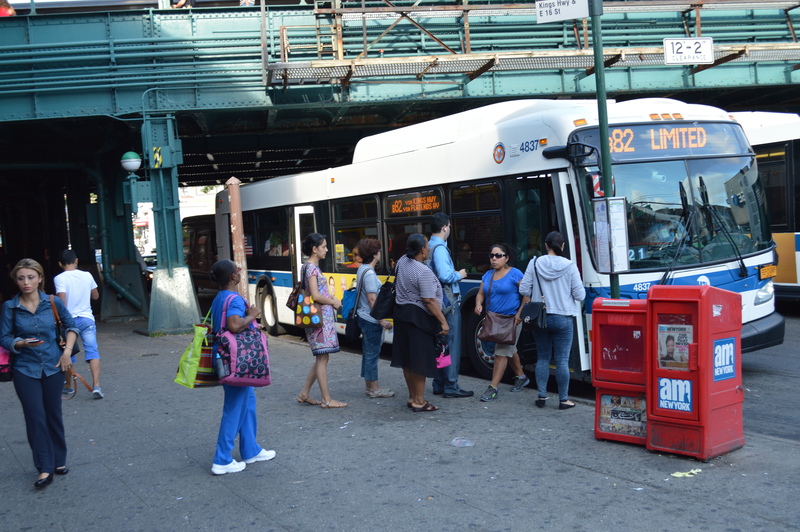 As part of the 2009 NYCDOT Phase II Bus Rapid Transit Corridor Study, improving crosstown bus service in Southern Brooklyn was identified as one of the most pressing bus service needs in New York City. The B82 currently serves 32,000+ riders per day and connects transit riders to 6 north-south subway lines and 21 bus routes. The B82 also connects riders to neighborhoods and jobs stretching from Coney Island to Canarsie and East New York. Select Bus Service improvements along this route will provide for better transit connections across Southern Brooklyn. NYCDOT and the MTA want to hear from you about the challenges you face with Southern Brooklyn crosstown travel and where improvements are needed along the B82 route. Please use the B82 Feedback Map to provide comments and suggestions. Stay tuned for outreach events on this page and at nyc.gov/brt. We look forward to your input to improve travel across Southern Brooklyn!